I have been doing Yoga. Not studying Yoga, but going to classes to do Yoga. Actually, I don’t really know what I’m doing though there is a great deal of talk (when I can hear it—I have certainly been in attendance at too many rock concerts) about breathing (which I have always done fairly well! ), and focusing and centering. Of course, during most the poses I am quite off center, unfocused, and sometimes struggling for breath. I will continue in the practice nonetheless. It is interesting, though, that when the hour session concludes I feel a bit otherworldly, a bit . . . somewhere else—and when I leave the studio I have to be somewhat cautious as I cross the street and head toward my car; and when I am finally driving home (she said during practice I was home!!) I keep the speed carefully slow and am exceptionally concerned that I’m not seeing something I should be seeing. One thing (among several things) that I am learning during practice concerns the insecurities I experience about doing the pose correctly. The teacher suggests that we practice with our eyes closed, but when I can’t see what others are doing I don’t know what I am doing! And tonight I thought that my obsession with doing things right can prevent me too often from doing things at all! Certainly this has been true in my scholarly practice: I am forever fearful that in my writing and speaking that I am setting myself up for humiliation. So tonight I tried to remember the practice poses and rhythms, tried to distinguish my Warrior I from my Warrior II, and actually (for a short while, at least) stopped worrying if I was doing anything correctly. But I was doing it. 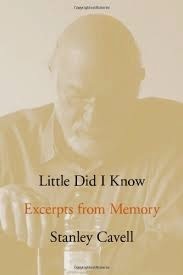 In his memoir, Little Did I Know, Stanley Cavell speaks of his own practice, not Yoga but philosophy. He says, “At most, day to day, isn’t what I have asked myself no more than whether I was interested to continue what I was doing, as I was doing it?” Which I am beginning to understand is not to do philosophy but to be a philosopher. There is the choice between living life and writing about it: Cavell teaches me that the two practices need not be separate. Stanley Cavell asks “So is it completely necessary or completely contingent that I have come to this place to tell the story of how I did not die from many catastrophes? And if it is neither [necessary or contingent] then what is the story of a life? And where is a place and what is a form to tell it?” I am paraphrasing; or I am asking the question I want to ask provoked in part by Cavell’s autobiography Little Did I Know, a book I have not yet finished. Because though he is writing his autobiography he is really questioning the reality of an autobiography. Does an autobiography track a life’s inevitability or does it record its contingency. If the former then an autobiography creates direction and the life becomes a work of art, a creation out of materials chosen and then fashioned with intent and forethought; but if the life narrated is understood as the result of contingency then what events does the autobiographer narrate except those that interest him/her in the present. I have been thinking for a long time about autobiography: if I wrote one what life would I want to portray? From what place would I choose the events to narrate to create the life narrated? What life would I want the narrative to portray? Who do I think I am compared to who others might consider me? Cavell defines the Tannhauser effect—a condition I experience—as the discrepancy between my feeling about my effort (my work) in the present and the effect that effort has on others. Yesterday, I got my annual royalty check for $78.29. My friends support my ego, but Cavell cautions me, “what friends cannot do is to prove that you have made yourself comprehensible to strangers.” Is the function of my work to make friends of strangers or strangers of friends? Cavell says that narcissism is a “suspended recognition of the separation of a world apart from me, a wish to show oneself, to make oneself, one’s work worthy of love.” How is my writing purely self-indulgent and narcissistic? And if I tell only a partial truth, then what part of the whole autobiography is true. And what am I to make of that part which is not true? But perhaps a life becomes so only when it is narrated and then it becomes available to be read as fiction. Fiction, Kendall Walton suggests, are works whose function is to serve as props in games of make believe, and that any work which has the function of serving as a prop in games of make-believe, however minor or peripheral or instrumental that function may be, is a work of fiction! Why do people write autobiographies? To create a life? Why do I read them?